Please check out the CASL 2015 section of our website for details! SCTL Director Dr. Lerner gave an invited talk to Stony Brook's Department of Neuropsychology. For more information about the Neuropsychology services of Stony Brook Medicine, click here. This family-friendly event is AHA's annual fundraiser and 90% of every dollar raised goes directly to serving individuals on the autism spectrum, their families and the professionals who work alongside them, providing crucial resources and support as they face challenges, build on their strengths and fulfill their potential. SCTL formed a bowling team to support AHA. To look out for more upcoming events with AHA, visit AHANY's page. ABCT is multidisciplinary organization whose goal is to enhance human functioning through behavioral, cognitive, and other evidence-based principles and therapies. SCTL Director, Dr. Lerner, is co-Chair of the Autism Spectrum and Developmental Disorders (ASDD) Special Interest Group (SIG). This SIG is committed to sharing and disseminating recent findings and ideas related to ASD and developmental disorders, as well as promoting training in evidence-based methodologies in across psychosocial interventions for this population. For more information, or to join the ASDD SIG, visit the SIG website. SCTL Alum Christine Spaulding, BA, SCTL Director Matthew Lerner, PhD, and Kenneth Gadow, PhD, co-authored the presentation, "Unique Patterns of School-Based Services among Youth with ASD" in the symposium, "Studying the Implementation of Evidence-Based Practices and Policy Mandates in Diverse Community Service Settings for Children with ASD." SCTL Director Matthew Lerner, PhD, presented in the Clinical Roundtable, "Addressing Real and Imagined Constraints in Utilizing CBT for Autistic Spectrum Disorder (ASD): Practices regarding the applicability of CBT to ASD," with Rebecca Sachs, PhD, Valerie Gaus, PhD, Jonathan Hoffman, PhD, Connor Kerns, PhD, and Eric Storch, PhD. Elliot Keenan, Ashley Culoso, Anthony Burns, BA, and Matthew Lerner, PhD, co-authored the poster presentation, "The Emotional Looking-glass: Alexithymia Predicts Vocal Affect Recognition Only in Individuals with Greater Autism Symptoms," at the ASDD SIG meeting. Jesus Pichardo, Tamara Rosen, BA, Rebecca Weber, BA, and Matthew Lerner, PhD, co-authored the poster presentation, "Taking Notice of Perspective Taking: the Effects of Attending to Social Interaction," at the ASDD SIG meeting. Erin Kang, MA, Tamara Rosen, BA, Matthew Lerner, PhD, and Kenneth Gadow, PhD, co-authored the poster presentation, "Trajectories of Atypical Communication Characteristics as Early Prognostic Indicators of Psychiatric Comorbidity in Children with ASD." SCTL director, Matthew Lerner, PhD spoke at this conference and focused on directions in understanding and treating social competence in ASD. This conference focused on putting research into practice and provided effective social, behavior, and communication strategies for individuals with autism spectrum disorders. The conference was held at the Desmond Hotel and Conference Center in Albany, NY. For more information regarding this conference, visit University at Albany's page. The 2015 Meeting of the Minds will be on the topic of Autism Spectrum Disorders. This is a scientific symposium open to all physicians, nurses, researchers, students and other healthcare professionals or caregivers with an interest in autism spectrum disorders. 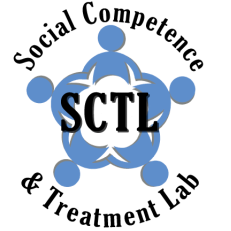 SCTL Director, Matthew Lerner, PhD, spoke at this event, and the Social Competence & Treatment Lab held an informational table. For more information, click here. The Asperger Syndrome & High Functioning Autism Association hosted their annual fall conference focusing on "Issues in Education for School-Age Students and Adults on the Autism Spectrum" with keynote speaker Michele Garcia Winner, MA. The Social Competence & Treatment Lab held an informational table and met with many families and providers. We are all very excited to continue working with AHA! SCTL Director, Matthew Lerner, PhD, gave a talk, "Autism: The Next Generation of Treatment," at the DoubleTree by Hilton Hotel & Conference Center in Somerset, New Jersey. Dr. Lerner thanks the New Jersey Alumni Chapter for allowing him to attend! Jacquelyn Gates, BA, presented, "Trajectories of School-Based Services for Youth with ASD," co-authored by Christine Spaulding, Kenneth Gadow, PhD, and Matthew Lerner, PhD. Tamara Rosen, BA, presented, "Emotion Recognition Trajectories in Autism Spectrum Disorders: Effects of Internalizing and Externalizing Comorbidities," co-authored by Rebecca Weber, BA, James Rankin, Erin Kang, MA, and Matthew Lerner, PhD. Matthew Lerner, PhD, presented, "Burden of Psychiatric Symptoms in ASD: Understanding the Full Range from Inpatients to Outpatients and Across IQ," co-authored by Carla Mazefsky, PhD, Matthew Siegel, MD, Robin Gabriels, PsyD, Diane Williams, PhD, Joseph Pierri, MD, Christine Peura, BA, and Kenneth Gadow, PhD. For more information on IMFAR, visit their website. The Social Competence & Treatment Lab teamed up with the SBU Autism Awareness Club and the SBU Department of Music to organize an exciting event for youth with ASD and their parents. This event was free and open to the public, but pre-registration was required. The event took place at SBU in the Staller Center for the Arts, and included a Storytelling Concert section and an Interactive Musical section, which families could move between freely. Check out the flyer for more details. This event was a great success! This event will be held again in the future. If you would like to receive a direct email invitation to register for this event when it next occurs, please email the SCTL at lernerlab@stonybrook.edu and mention "future ASD & Music events." The Asperger Syndrome & High Functioning Autism Association hosted their 15th annual Spring conference this April focusing on "Issues in Independent Living for Adolescents & Adults on the Autism Spectrum," with keynote speakers Peter Gerhardt & John Robison. The Social Competence & Treatment Lab will held an informational table, and had a fantastic time attending talks and chatting with families and providers. We look forward to being a part of more AHA events in the future! Dr. Lerner spoke at the NS SEPTA meeting on "New Directions in Understanding and Treating Social Competence in Autism Spectrum Disorders" at North Shore High School in Glen Head, NY, during Autism Awareness Month. This talk was open to the public and had a great turnout! For more information, visit NS SEPTA, or check out the flyer. Dr. Lerner gave a talk at Queens College's Clinical Psychology Colloquium, "Catch Me If You Can: Novel Mechanisms of Social Functioning and Intervention in Youth with Autism Spectrum Disorders," discussing his past and present research. Dr. Lerner spoke at the SCASN (Suffolk County Association for School Nurses) Conference on Emotional & Behavioral Issues in the School-Aged Child in Stony Brook University Hospital. During his talk, "Autism and Social Functioning," and throughout the day, the SCTL team held an informational table. For more information, check out the flyer. Dr. Lerner spoke at the North Bellmore SEPTA meeting at Martin Ave. Elementary in Bellmore, NY during Autism Awareness Month. This talk was open to the public and had a wonderful turnout! For more information, visit North Bellmore SEPTA. Dr. Lerner provided a brief history and overview of interventions designed to address social challenges among school-age and teenage youth with ASD. He introduced the concept of "therapeutic mechanisms" and described what types of treatments may work best and for which individuals. Finally, he knit these insights together by presenting research emerging from the SCTL. For more information, visit DDI's website. SCTL Director, Dr. Lerne﻿r, chaired and presented a paper symposium, "Psychiatric Comorbidity in Autism Spectrum Disorders from Childhood to Early Adulthood: Predictors and Consequences" along with colleagues at Stony Brook University, Drexel University, University of Notre Dame, Virginia Tech, Vanderbilt University, and Cornell. SCTL Coordinator, Rebecca Weber, presented a poster, "Parent and Self Report Informant Discrepancy of Social Skills Importance in Adolescents with Autism Spectrum Disorders," co-authored by James Rankin, Erin Kang, Jacquelyn Gates, Patricia Medina, and Matthew Lerner. SCTL honors student Christine Spaulding presented a poster, "Different Perspectives on Symptom Severity in Autism Spectrum Disorders and their Impacts on Service Frequency and Specificity," co-authored by Bianca Marro, Tamara Rosen, Kenneth Gadow, and Matthew Lerner. For more information on the conference, visit SRCD's website. SCTL Director Dr. Matthew Lerner gave an informational talk at ASPIRE Center for Learning in Melville, NY, about social skills interventions and current research going on in the SCTL. Visit the ASPIRE website, here. If your child is enrolled in the upcoming season of social skills groups at ASPIRE, you and your child are eligible to participate in one of our studies, Social Skills in a Virtual Environment. Call the SCTL at 631-632-7857 for more information and to participate! The Quad Preparatory School in New York City is holding the only annual conference exclusively for Twice Exceptional education. This conference will bring together psychologists, educators, physicians and advocates to discuss cutting edge topics regarding how these children learn differently. SCTL director, Dr. Matthew Lerner, will be there as an invited guest speaker to give a talk, while the rest of the SCTL will be holding an informational table! To find more information, visit their website.